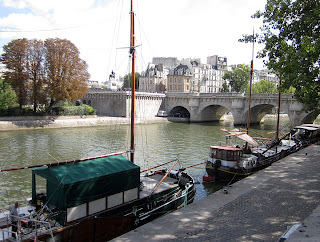 I was debating whether to even try to write this evening, as I had a marathon day in Paris and am exhausted. I’ll give it a shot, and if I begin to ramble I’ll just hold off. I accomplished an amazing amount today, so I hope I can focus! First, the weather was ridiculously beautiful. I am praying to the weather god to let it hold for just a few more days – even one day will do, but please whatever your name is, weather god (reminds me of a line from A Funny Thing Happened on the Way to the Forum: “whichever one of you did this, thanks!”), let’s go for two! Can you feel it? I can. It’s two hours later, I am back from steak/frites along with vin rouge from Bordeaux, now washing it all down with a large bottle of 1664, and I think I’m ready to continue! After my simple but tasty breakfast of bread, croissant, and coffee, along with yogurt and orange juice, I hoofed it to my nearest metro station, the madhouse that is the Gare du Nord, and caught the number 4 line to Chatelet. There I could have transferred to the number 1 line, but it was so lovely a morning that I decided to walk along the Seine to the Louvre, and I’m glad I did because while it may have taken slightly longer the air was fresh and, oh, did I mention I was walking along the Seine? I did, I know, just testing – in other words, what’s not to like? Have you been to the Louvre? It is enormous. With apologies to the National in London, the Met in NYC, even, dare I say it, the Uffizi in Firenze, this is the mother of all museums. This is true partly because it began as a fortress/palace, built in the twelfth century. It continued as a palace until Louis XIV moved his court lock, stock and highly ornate barrel to Versailles in the late seventeenth century, after which the Louvre housed the royal family’s art collection. In also became home to the Royal Academy for visual arts. As any schoolboy (or girl) knows, at least any of those who have taken my theatre history class, the Royal Academy for the written word was begun earlier, when Cardinal Richelieu decided to unite the nation. In order to unite the nation it made sense to unite the several dialects spoken in the various parts of France into a united, elegant language. 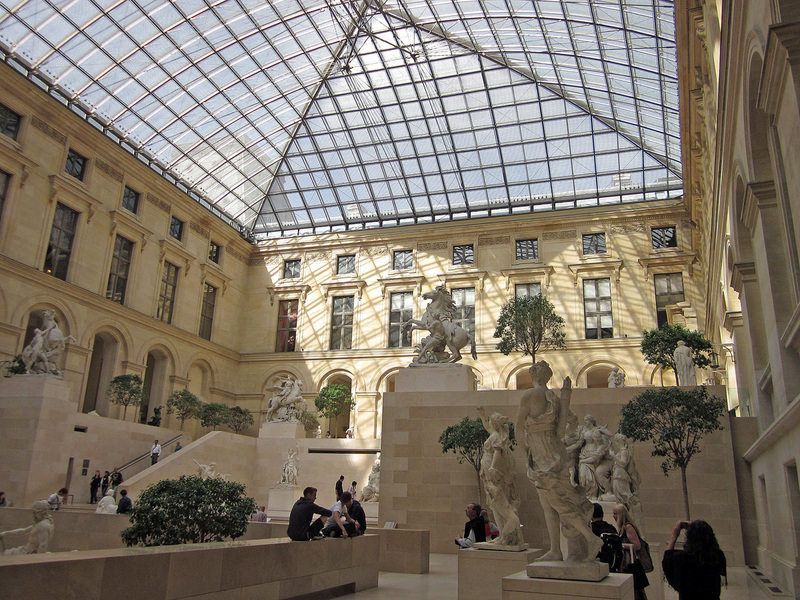 It took the French Revolution to re-create the Louvre as a museum open to the public. So it has remained until today, and I daresay for some many days to come. It boasts several impressive collections, from antiquity to the mid-nineteenth century, to just before the advent of impressionism. Its Italian painting collection is vast, although most tourists elbow their way through crowds to see or photograph, point and shoot digitals raised high over their heads, the Mona Lisa. I should probably not comment on this, but I find it highly amusing. I wonder how many know or care that just outside the room that houses Leonardo’s donna with the mysterious smile, there are three equally impressive Leonardos that go almost completely neglected. Well, that’s not completely true. Since Dan Brown’s Da Vinci Code there is some interest (and rightly so!) in The Virgin of the Rocks. I always want to say ON the rocks, but that would be improper – “Hey barkeep! Gimme a double virgin on the rocks.” A double virgin? I think I’ve known a few, and failed to adjust their status, try as I might. There are also about five Raffaellos (paintings by the man we call Raphael) down the corridor, along with Caravaggios and many other fine works by other fine painters. To my mind the frenzy to push their way through crowds for one painting behind bullet-proof glass is a bit silly, but then so are most tourists. Frenzied AND a bit silly. Whew! Glad that tirade is over. Whatever you think about the Mona Lisa, among the many collections the Louvre houses, they boast a brilliant collection of French paintings. It was my aim to seek out as many as possible from the eighteenth century and revolutionary era. That way if we can work it out in November when we bring students to Paris that we all go to the Louvre I can easily get them from room to another. I was stymied in this by the Louvre’s nasty habit of shutting down large sections of its collections, partly because of necessary restoration work, partly because they don’t have enough docents to man the rooms necessary. Today it so happened that eighteenth century French paintings were ferme! But I was assured that tomorrow they would be ouvert, so I shall return. In the meanwhile I was not about to leave the Louvre without racing around to see some of my favorites, and in fact while some works by Jacques-Louis David are placed in a room with nineteenth century French painters, some of his daring neo-classical and also revolutionary paintings were on display in the crowded Denon wing. 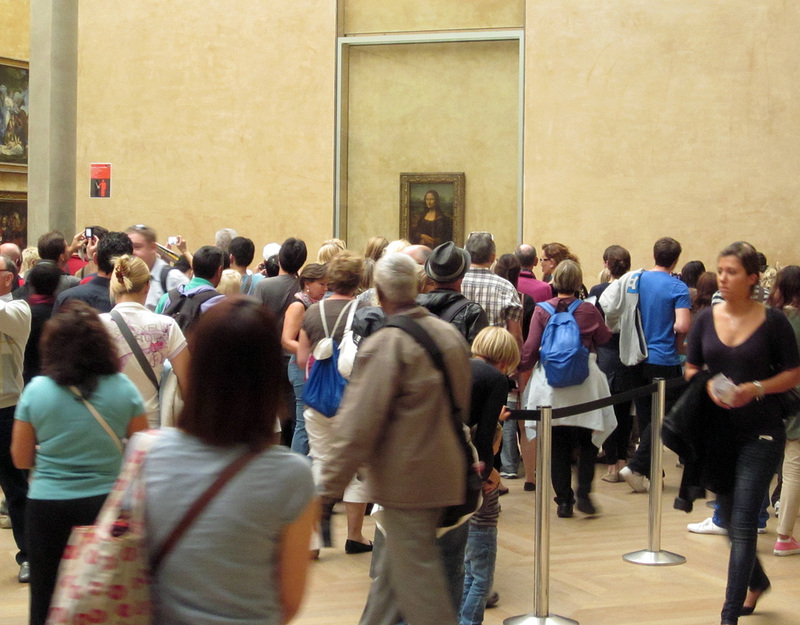 Crowded because that is the wing that houses the Mona Lisa – but I digress – again. So I caught those, and also only two rooms away the great Delacroix and Gericault canvases, that, post-revolution or not I was happy to see. Three hours passed on my journey for knowledge in the Louvre. And then I admitted to Louvre overkill and got out. Into a gorgeous early afternoon. I was headed next to the Conciergerie, Marie Antoinette’s last residence, along with many others before they were ridden in carts the long distance to the Place de la Revolution (now re-named the Place de la Concorde) and introduced to Mme Guillotine, but was determined to get a fairly inexpensive lunch before I entered. I settled upon a very tasty grilled jambon, tomate, et fromage sandwich from a stand, wolfed it down in front of Notre Dame, and then made my way into that under-visited but fascinating part of the Palais de Justice where the concierge lived, thus the name. I had been before, in fact had taken students when I taught my French Revolution seminar in fall 2005, but I am trying to prune the trip this semester and am debating, still debating even as I sip my last sips of 1664, whether to merely point it out to them or spend the 6 Euros fee for each of them and take them in. patron saint, Ste Genevieve and final resting place to Voltaire (re-buried there during the Revolution, the first to be so honored, along with many others, including Rousseau, Victor Hugo, and Emile Zola. It’s quite an imposing place, and also has French Revolution resonance, as it was turned from a church which was built at the command of Louis XV. 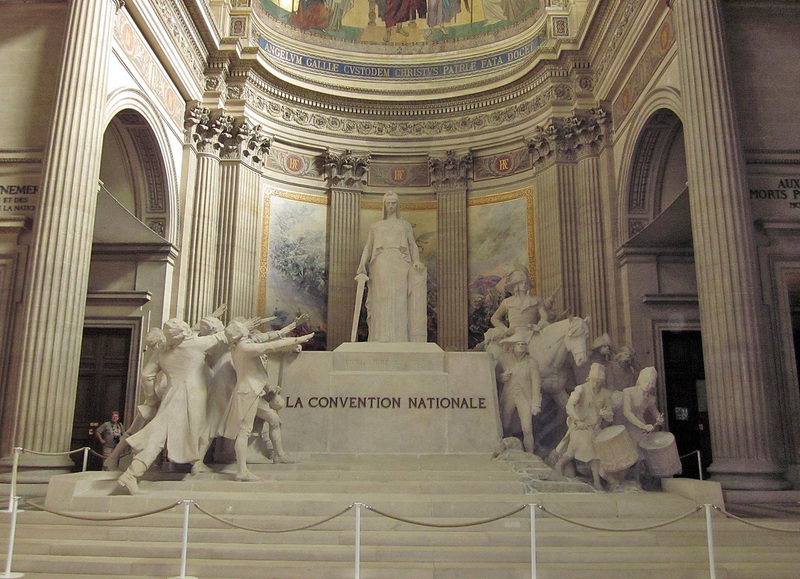 When the Revolution came it was recreated as a non-Christian monument to French dead. Rabid revolutionary Jean-Paul Marat was placed there, but after the reaction against the increasing amount of blood shed by Mme Guillotine, his rancid body was exhumed. I left there at about 3 pm and was now feeling the effects of this extraordinary day, but was determined to head (downhill, thank the gods again) to the Luxembourg Gardens and Palace. You ask why? 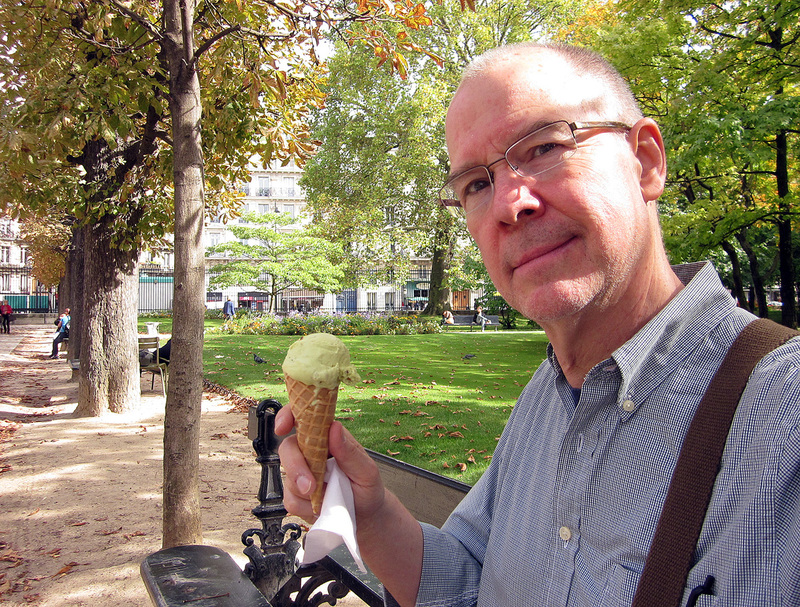 To sit in the gardens and eat an excellent pistachio gelato, which I did and very much enjoyed. But also because during the Revolution the Luxembourg Palace was one of the many places in Paris transformed into a prison. I had been to the edges of the gardens before, but never in, had never enjoyed the pleasant surroundings, the beautiful orangerie, had never downed a gelato, until today. 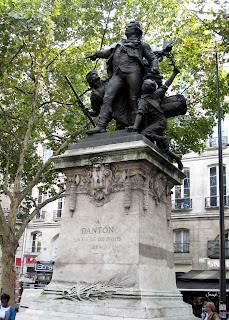 Finally I made my way the relatively short distance to the Odeon, one of the most important theatres in paris today, then just down the street to the Odeon Metro, in front of which stands a statue of the Revolutionary hero Georges Danton. Another revolutionary reference! It's ALL about the Revolution, mes ami, all about my class and the stuents in it. What a [rpfesspr! I then caught the number 4 Metro all the way back to the Gare du Nord, after which I collapsed, after which I started this post, after which I slipped off to a tasty dinner of steak/frites, after which, just now in fact, I bid you all bon nuit!